Whether small and intimate, or immense and extravagant, we offer three varying packages that are sure to fit and fulfill any wants and needs that you may have for your special day. With no hourly limitations the Platinum Package is ideal for couples that are interested in having coverage for the entirety of their day. This includes the photographers being available as early in the day as requested until the end of the night. This particular package is especially perfect for those who want photos of the bridal party getting ready or have planed a grand exit at the end of their evening. With eight consecutive hours of coverage the Gold Package is perfect for couples that would like to capture all of the traditional moments from both the ceremony and reception, and have enough time to record some of the getting ready process and open dance floor. How the time frame is spent is entirely up to you, and can be further discussed upon booking. 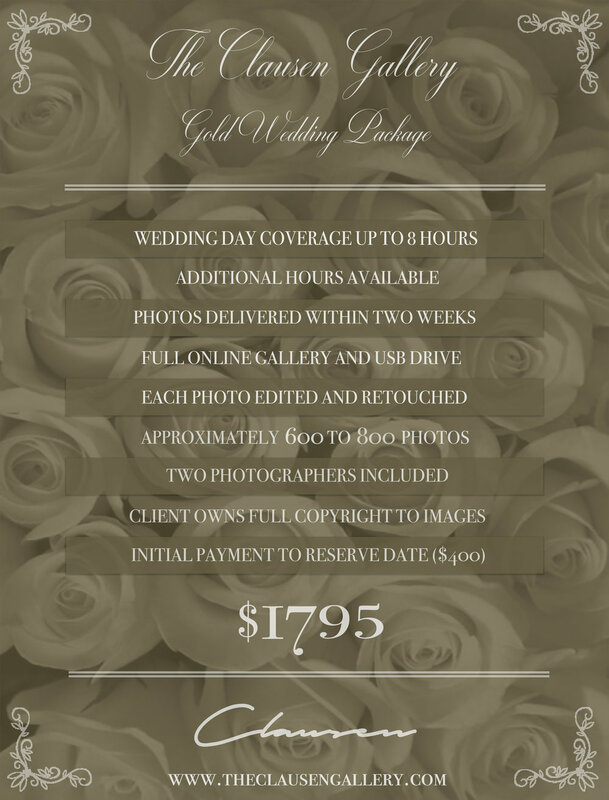 With six consecutive hours of coverage the Silver Package is excellent for couples that would like all of the traditional shots from both the ceremony and reception. If the timeline allows, some of the getting ready process and open dance floor may be captured also. How the time frame is spent is entirely up to you, and can be further discussed upon booking.